If you – like me – have kept a certain sense of boyish wonderment, you may have delved into Science Fiction books now and then and be familiar with the work of Pratchett. His is an elaborate vision of an alternative world, not a globe like ours, but flat and with a distinctive edge where it ends. If you were standing at that world's end, you would look down a vertical cliff of indefinite height, with mist and distant fog hiding the down yonder. This vision came to mind when I was clinging to the edge you are seeing above, in company with the ant sized persons standing in the upper right of the picture. What were we seeing, when looking beyond and below this impressive red precipice? 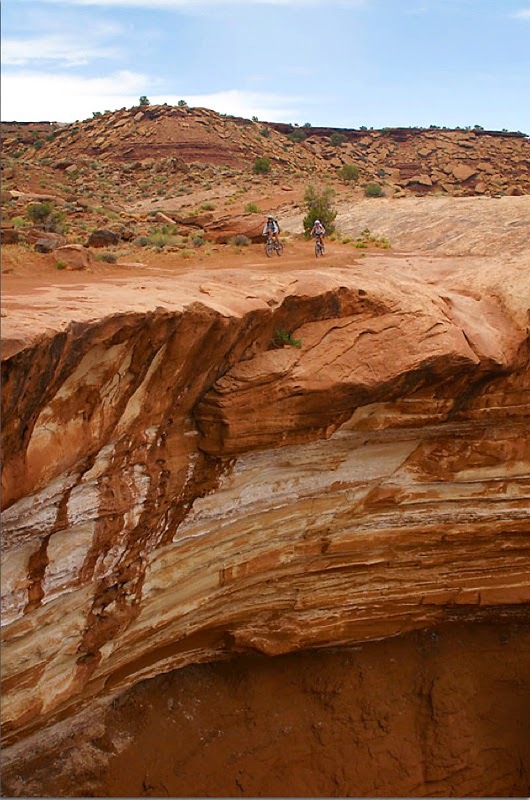 Precipice is the right word for it, since it is sloping down for almost half a kilometer, before ending in a flat basin of White Rim Sandstone (actually, the color is more brown-like) that stretches many kilometers to the South. 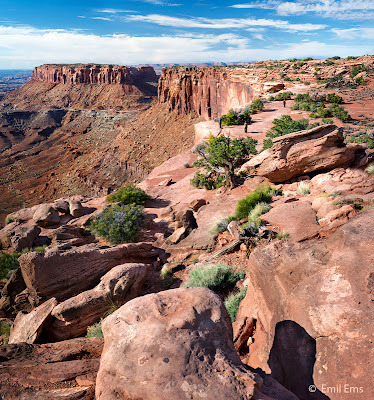 About halfway into that basin, a mighty river, the Colorado, has cut a meandering deep valley into the White Rim Sandstone, called The Loop. At the opposite side, you can barely glance, in the mist, a wall that must be about the same height as the one we are standing on top of. Further out, plateau upon plateau is filling the void, with the odd higher mountain or two towering over it all. The edge we are standing on belongs to a small and narrow tableland, called Island in the Sky. This plateau is jutting out, like a peninsula, into a broad and wide basin shaped by the eroding confluence of two mighty rivers, the Green River and the Colorado. 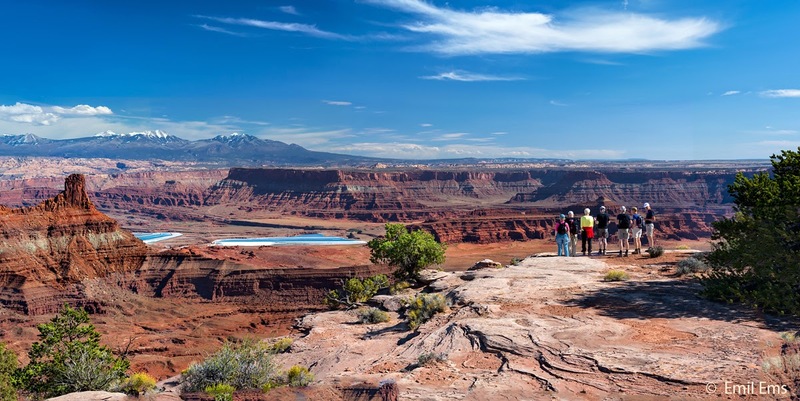 We are in the very core of an immense collection of tablelands, called the Colorado Plateau, one of the utmost wonders in the world. The Colorado Plateau is about twice the size of Sweden. From where we are standing, and looking South in the direction of the picture above, it reaches out for another 60 miles or so – and we are talking SWEDISH MILES here, not paltry Imperial ones. How did this immense region of flatland upon flatland, situated at an average 2 kilometers above sea level, come to be? That expanse is something of an anomaly in the geologic scheme of things. It consists of a single, very (many kilometers) thick block of Earth crust that has remained remarkably stable over the eons (the past 600 million years), with very little disruption like faulting or folding of rock layers; this in stark contrast to all surrounding regions in America. About 30 million years ago, this whole block, essentially flat, was lifted some 3 kilometers upward, by forces still uncertain. It was raised as a unified "table", albeit with a slight upward tilt towards the North. The main rivers already existed before that and could resume their eroding tasks with a vengeance at the increased altitude. The result we can nowadays admire as an immense region of flat tablelands at differing altitude, interspersed with canyons and wide basins; all caused by eroding streams, helped by their friends the wind, rain, snow, ice and sand. We had reached the view point mentioned above on our way to Upheaval Dome (Bubble or Trouble?). On the way there, our guide made a brief stop at Island in the Sky's Visitor Center, to give us hikers a chance to get acquainted with the National Park. 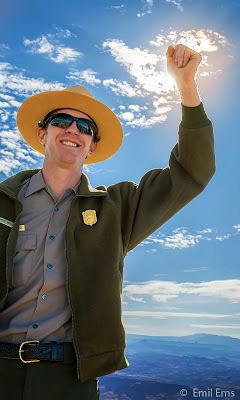 There we were told that a Ranger would give a presentation at eleven am at the Grand View Point Overlook. Now, Rangers are generally excellent presenters, with many acting out an impressive performance so, off we rushed, eager to partake in the experience. And we were not disappointed. 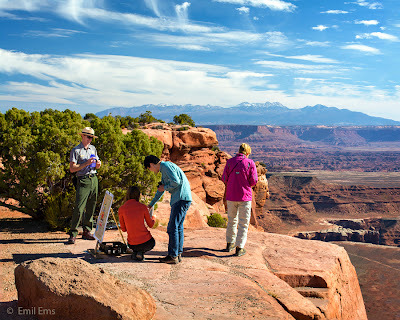 The view from up there was extraordinary, as already described above, and the Ranger was busy preparing his lecture. And what a performance he gave! The theme of the day was the Powell Geographic Expedition of 1869 . John Wesley Powell was a one armed Civil War veteran, with some experience of river rafting, as well as a solid education in natural sciences. 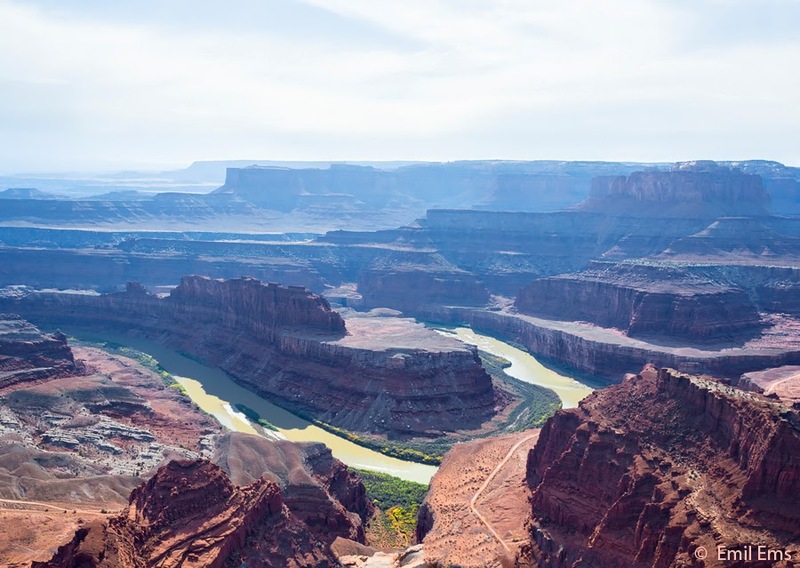 He decided to be the first to raft the waterway of the Green and Colorado Rivers, from Wyoming to the confluence of Virgin River and Colorado in Southwestern Utah. In this way, he intended to pass through and chart a major part of the Colorado Plateau. He had nine companions with him, five of which made it to the end. One of the others, an Englishman, had enough early on and went on to more mundane things. The three remaining, experienced trappers and hunters all, gave up towards the end of Grand Canyon, fearing that they would not survive the rapids they saw ahead of them. 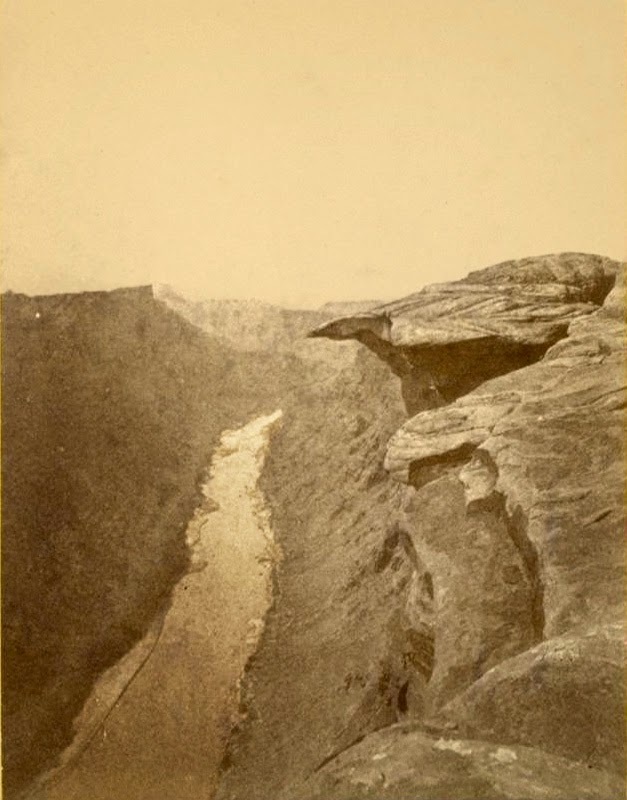 They hiked out of the canyon, never to be seen again, whereas Powell forced the remaining narrows successfully and arrived at his destination, the Virgin River, unharmed two days later. Hearing the Ranger speak about this remarkable venture made you almost believe that Powell himself was standing before us. The man's exploits speak for themselves, but the presentation touched upon many interesting details not usually mentioned in the summaries made about his expedition. For instance, Powell had the habit of climbing the canyon walls, one armed, in order to gauge their height. This was done by measuring the difference in air pressure between bottom and top, so he also had to balance a delicate barometer in his pocket during each climb! For us weaklings, just looking DOWN one of those slopes causes you vertigo, not to speak of climbing them with one hand in your pocket! This is a man of dedication for you! He also preserved many views of his trip for posterity in remarkably well made pictures. This picture, for which he also had to take a CAMERA AND TRIPOD with him, when climbing the canyon wall – isn't it amazing? –, shows a view of Cataract Canyon, a canyon just South of Island in the Sky, and carved by the Colorado soon after having been joined by the Green River. The river looks rather peaceful from above, doesn't it? In fact, this is the steepest and wildest reach of the Colorado, containing 64 rapids. No wonder Powell wanted to document it before daring its descent. Enheartend by these tales, we rushed onwards to our exploit of Upheaval Dome (Bubble or Trouble?). Another outer worldly experience! But the day was far from over. Upon our return from this big "hole in the ground" we stopped at another view point on Island in the Sky, called Green River Overlook. I am mentioning this brief interlude since it provided me with a vista already documented from a slightly different angle in the previous post. We are again standing on the Island's rim, but this time on its Western side, and looking in a Westnorthwest direection. The basin we see at our feet is carved out by the Green River, which at that stage is as mighty as the Colorado. The dark configuration on the upper left is intriguing. The river used there to run through a loop canyon cut out be itself, just like The Loop of the Colorado, seen earlier. However, it does not run through the loop anymore, since it has found a much shorter way by eroding down a dividing canyon wall. We are here admiring the so called Anderson Bottom Rincon. 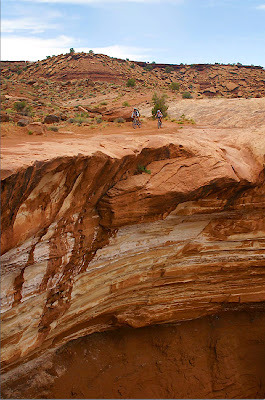 You may recall an earlier picture taken along the trail to Upheaval Dome (Bubble or Trouble?). It was taken much further North on this Western Rim of Island in the Sky, at a lower altitude, and heading the camera towards Northwest. Therefore it does not show the Anderson Rincon any longer, rather, a stretch of the river basin further North. Time to leave Island in the Sky, you think? "Yes! ", in a way. But on that same day's afternoon we had rushed on to a further hike – weren't we hardy? – that took place on a small side-peninsula, jutting out southward from the Island at its Northeastern end. It has a rather narrow start, being only 30 meters broad there, and has its end-viewpoint just on top of a very scenic loop of the Colorado. It is called Dead Horse Point. Our hike started at the Visttor Center (it is a State Park), which is located at the narrow neck of the small peninsula. From there we went South on its Eastern side, all the way down to the view point. It was getting later in the afternoon, so we had to hurry, but there was still time to take a nice panoramic picture of the gorge below us. I invite you to double click on the picture below, so that you can get it at full size. In mid-afternoon, the "light is getting right" for landscape pictures and you can see far on this one. 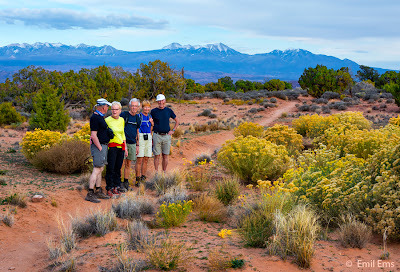 On the upper left you are looking at the La Sal mountains, which we could admire already in Arches National Park (A City Built on Salt), although most of the snow on top had melted away since. 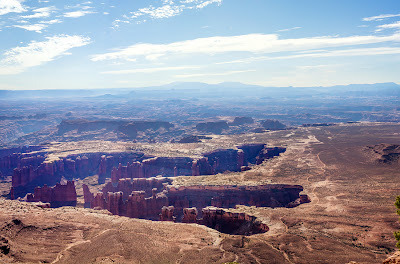 Speaking of Arches, you can just about locate it as the light brown piece of land on the upper left under the La Sal. Below it you can also discover the huge red wall (partly hidden by the tower located in mid-distance) we had to climb with the car to get up there from Moab. Further down, let me point out to you to the two lakes located in the upper basin. You may have guessed already that those cannot be natural, with their azure color and incongruous location. And your guess would be right. We are seeing here a huge mining compound, which is producing Potash (potassium carbonate). This is done by pumping water with high pressure into the mines, thereby leaching out the salts in question. The resulting brine is then kept in the two large reservoirs we are seeing and left to dry. After the water has evaporated, the potash can easily be collected. A primitive but effective manner of production, and probably not very poisonous either. After all, we are talking about some kind of baking powder here. But it is getting late in the afternoon, so let's hurry on the the main Viewpoint, which permits us a look straight down on the Colorado, as it is carving its curvy route through the wide plain. 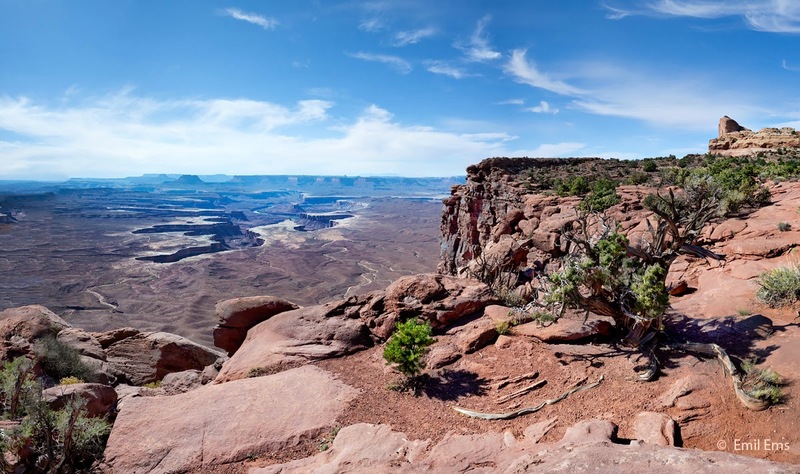 At this stage spectators use to put two questions: Why "Dead Horse Point"? And where does the road lead, that you can glance winding around on the plain rounding the river? As to the first, there is an intriguing story behind it. The small peninsula in the sky we are standing on, was used, in olden times, by cowboys to corral in wild horse, the "mustangs" they caught in this wild landscape. Since the peninsula had a small neck, only 30 meters wide, you could easily fence it off there and keep the mustangs enclosed. The saying is that the cowboys selected only the best horses for sale and left the rest to die; there is no water up here so they either had to die of thirst on the spot, or die trying to climb down to the big river. 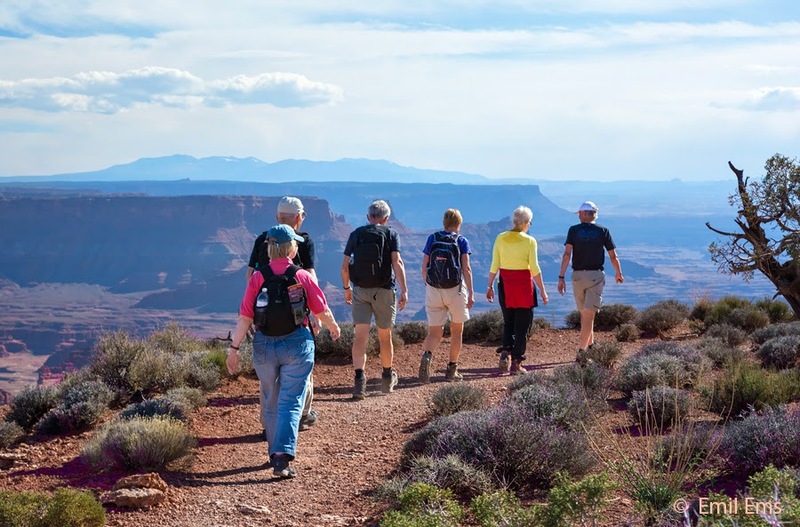 The road you are seeing is really a dirt trail, the White Rim Trail of fame. It circles all around the Island in the Sky – including its sidekick, the Dead Horse Peninsula – and mainly follows the winding courses of the Green and the Colorado. It was originally built by the State as an access road for miners, looking for promising stakes, but is nowadays a cult track for bicyclists and four-wheel drivers. If you feel the urge to go down there and join them, why not have a look at a famous blog describing a cycle tour along the road, with pictures and all. The picture below is borrowed from that blog. That gotten out of the way, we can concentrate on our return hike, this time along the Western Rim of Dead Horse Peninsula. Again we were confronted with marvelous views, but this time quite different. What we were admiring here was a comparatively narrow canyon separating this small peninsula from the main Island in the Sky. Furthermore, the sun was now approaching an angle sufficiently low to get me excited as photographer! So let's polish off our overlook pictures with a cosy panorama, actually my favorite picture from this trip to Utah. This time, I got even myself into the view, but don't ask me how! Only two of our group are missing, the rest busy with admiring the scenario. I said above that there was a narrow canyon separating us from the greater Island in the Sky. Let me emphasize this by pointing out to you the great wall on the horizon. It is cut off rather abruptly towards the upper left of this picture. This is nought but the Western Rim of Island in the Sky! This is were I was standing, a bit to the right of the cut-off, when taking the title picture of this blog post at eleven am that very morning. You may think that the canyon in between is not as small as that! This may be true, but size is relative. Compared to the basin carved out by the two mighty rivers, it stands indeed as a small, and narrow feature of Canyonlands. And rightly so, since it was not created by either great river. Its creation must rather be sought in small rivulets of water trickling down from the upper plateaus, and getting substantial only in periods of heavy raining. But it does not take much to create a canyon! Imagine a small rivulet that is cutting off half a millimeter of sandstone beneath itself once a year, after a heavy rain. This makes a cut half a meter deep in a thousand years, but HALF A KILOMETER DEEP in a million years. And a million years is to geology what a blink of the eye is to us! But we are still humans and to us it is important to get a nice meal once the sun has set. Fortunately, there were only 20 minutes left to hike back to the Visitor Center, where our car was parked. 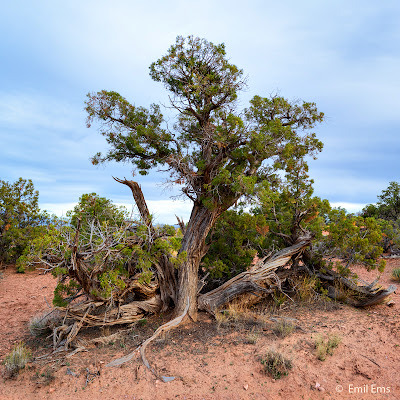 In the mean-time the sun had already settled behind low clouds, and a beautiful mellow light was shining over the sagebrush and the pinyon pines we had to sidestep along the way. 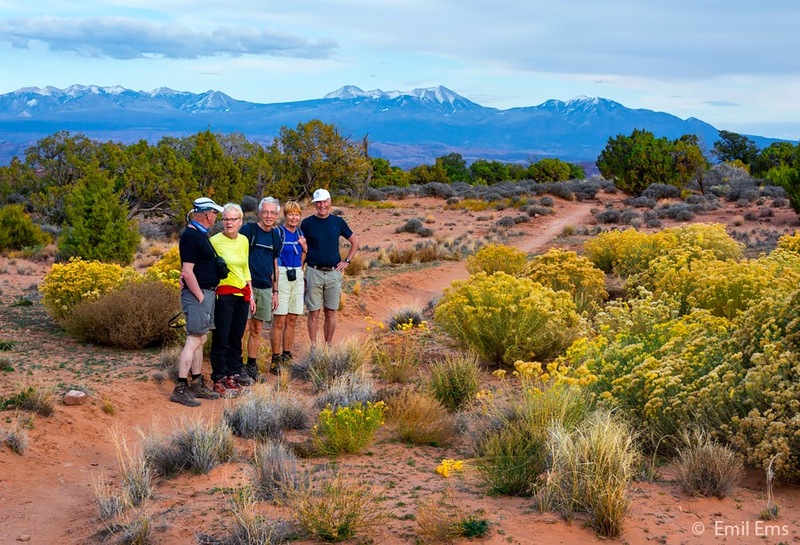 It must have rained or snowed rather heavily a week or so prior to our arrival – shaving off another half a millimeter from the canyon floors –, since the sagebrush was showing off its very best bloomings. But, to brush off this blog post that has concentrated on big stones most of the time, below is a portrait of the Pinyon Pine, since I suspect most of you readers have scant an idea of what it looks like at closer range. hey nice post mehn. I love your style of blogging here. The way you writes reminds me of an equally interesting post that I read some time ago on Daniel Uyi's blog titled How Frequently To Workout For Maximum Muscle Gains . 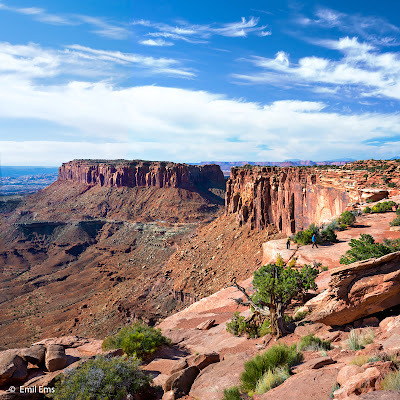 Bei diesen wunderschönen Bildern vom Arches Park und Canyonlands kommen schöne Urlaubserinnerungen hoch. Auch wenn Du offenbar ein begeisterte Hiker bist, solltest Du in dieser Gegend mal das Mountain Bike oder das Allradauto für den Shaffer Trail probieren. Ist auch nicht ohne.. Thank you kindly for your comment and suggestion. But I fear that this was my last trip to Utah. In beauty it is, indeed, but if you think that this landscape is flat, you haven't seen the Hungarian puszta. By the way, am very soon coming to Stockholm where I will, believe it or not, stay in a flat(!) with a very flat rate! Hoping to see you there. No need though to bring your camera. Suggest you save it for Hungary that we could easily explore from here. Just getting around to reading your blog entries. As usual, they make me want to run right out and see the beauty that is so very close to our home here in Ca. 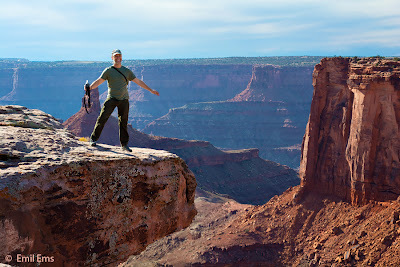 I might be going to the Grand Canyon (finally!) in May. I hope to get to Utah this summer as well. Thank you for all your wonderful photographs and well researched insights. I will be back to see them before I head out to the field so I don't miss anything! Howdy! Someone in my Facebook group shared this site with us so I came to check it out. I'm definitely enjoying the information. I'm book-marking it and will be tweeting this to my followers! Excellent blog and terrific style and design!